A digital exchange between Adriana Villagran and Bucks County artist, Rebecca Reeves. Truth be told, I would have loved to sit down with Rebecca Reeves in person to pick her brain about her art work, which begs to be further investigated. However, as Bucks County and San Francisco are separated by a vast 2,900 miles, we had to settle for a digital exchange. My initial investigations of Reeves's work perceived through the digital sphere of her online presence pales in comparison to the insights and anecdotes she provided me through our correspondence. "Reeves’s system of living becomes the foundation for her work. Her observations fuel the need to clean and organize in order to gain control over her environment. 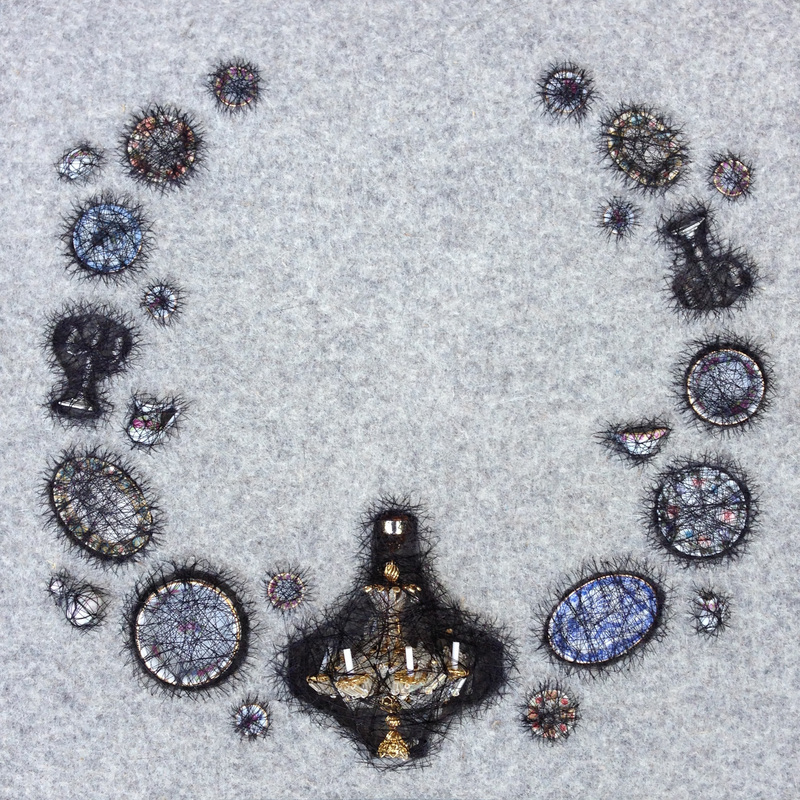 In her current body of work, Reeves considers herself, the “Collector, Protector and the Keeper” of numerous family heirlooms. 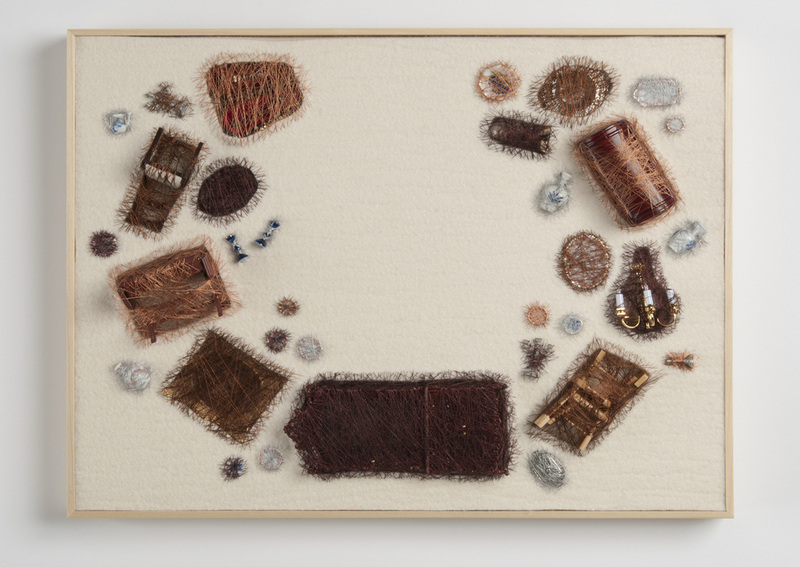 Similar to the meticulously detailed Victorian human hair wreaths which represented the family tree; Reeves uses miniature furniture as representation for the objects in her home, her family tree. She obsessively cocoons the miniatures in thread in order to contain and preserve. Nearly, suffocating them in the process." Can you elaborate on what you describe as your “system of living”? I always say my work is derived from my system of living. I’m a clean and organizational fanatic. It’s in my blood. Handed down to me from generations before. I clean and organize in order to gain control over my environment and in turn my life. Working in the miniature allows me to gain complete control over the work. My work is inspired by my day-to-day habits, pet peeves, observations and comparisons to other peoples’ systems of living. You refer to yourself as the “Collector, Protector and the Keeper” of your family’s heirlooms? Is this a self-designated role? There are a couple of scenarios that peg me for the role. I am an only child and the oldest grandchild on my maternal side. As far as my paternal side, my Grandfather was the original keeper of the family heirlooms and an only child as well. Again, it is in my blood. I am so grateful to my ancestors for preserving the heirlooms that I now cherish in my home. My need to gain control also plays a huge part in the aspect of “the protector.” I feel the need to preserve my family history and hope that one day another family member will be just as enthusiastic and caring for our objects. Across the board, on both sides, from generation to generation we are Collectors, Protectors and Keepers. On top of these miniature sculptures you also you also stage mini scenes in the form of archival prints in your "Dirt Crimes" series (above). Why did you choose to present them this way? Why not display the miniature scene itself? Each scene is a reenactment of a previous “crime” that occurred in my domestic space. Similar to crime-scene photography where each clue is documented separately, the rooms are presented in fragments. The body of work was inspired by Frances Glessner Lee’s, Nutshell Studies. Her murder models were designed as an instructional tool for detectives. In a similar fashion, my sculptures illuminate my obsessive level of cleanliness, which the viewer compares to his or her individual notion of cleanliness. What draws you to Victorian hair wreaths? I’d never heard of these before. They’re quite a fascinating piece of family preservation. When did you first come across these? loved one or even a secret love. My current body of work draws from this inspiration. The largest pieces in the series are titled, “Family Preservation”. Each one represents a room in my house. Miniature furniture and objects are representations of actual pieces in that room. The composition of those pieces are that of a horseshoe shape and the thread color represents the color of hair. I carve into the felt and place the item in its designated resting place. I obsessively stitch or cocoon the miniature pieces until the appropriate “protection” has been completed. The next grouping of work in the series are titled. “Keepings”. They are fragments of rooms, therefore they might only have a couple of objects cocooned into the felt. The smallest of the series are titled, “Specks” and they are just one or two objects that exists within the room of my home. The Keepings and Specks are cocooned with white thread as I was inspired by the Japanese caterpillars that cocoon on the tree branches. With such an obsession, they create tent-like cocoons that then kill the entire tree branch. As I say, I cocoon in order to preserve and protect, nearly suffocating them. In the most recent piece created and my favorite thus far titled, “Gathering” I have introduced black thread. The black thread represents the hair coloring on my Mother’s Italian heritage and blends in the darker side of my work. I have to ask: why did you and your husband start collecting Post Mortem photography? How did that happen? We respect the artistic expression of death. The sculptures in the graveyards, the fashion of mourning, the jewelry and the documentation of the deceased. In my early years of college I had the privilege of studying under the professor, Jay Ruby. Ruby owned over 500 post mortem photographs at the time and was one of the first to create a book on his collection titled, Secure the Shadow: Death and Photography in America. So what about the action of cocooning the miniature pieces, which you say is almost suffocating them. What does this action represent for you as the collector, keeper and protector? As the protector, the act of cocooning is essential as it creates a metaphor for safe guarding or preserving. The entire piece of furniture/object isn’t covered, there are still exposed or potential areas of harm - leaving a sense of uncertainty. But how does the suffocating tie into the protection? To cherish the priceless heirloom so much that you nearly suffocate it, trying to maintain its perfection. Or when you hold someone you love as tight as you can to show them how much you love them. ﻿Would you ever consider creating life-sized versions? For example would you ever try to use a regular sized chair as opposed to a miniature? ﻿For one of my recent exhibitions, I did a window installation with two of my childhood chairs. 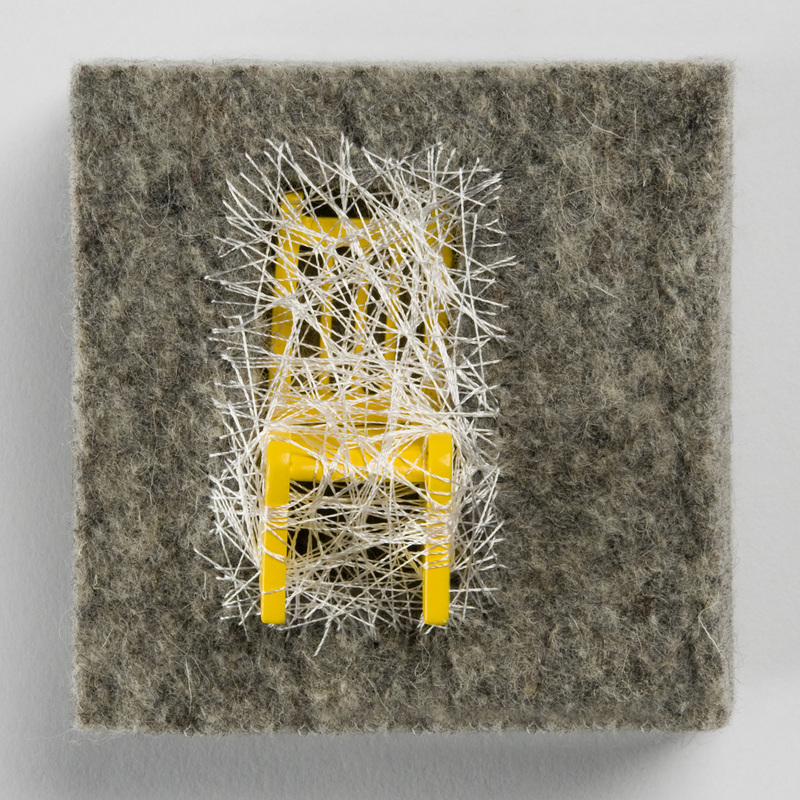 These yellow chairs have been represented as miniature yellow chairs in a few of my pieces in the “stitched” series. I used thin weaving string and wrapped them individually until a cocoon was formed. I never considered them a piece, more just a window display. I’m not ready to use my collections in my work yet. I see them as a finale body of work. “Finale body of work”? What do you mean by that? I think about the future of our collections. Who will cherish them as much as we do? So I have planned out my finale body of work for when I’m an old woman. I figured, I would use our collection as the main material in my work and then collectors would cherish the pieces as I did. In turn, giving them continued life. During our digital to-and-fro, Reeves revealed to me a bit about her unusual living space which bares repeating. First, it is important to not that Reeves's paternal Grandfather was a Methodist Minister so she is naturally drawn to the art of church architecture and imagery that surrounds the subject. 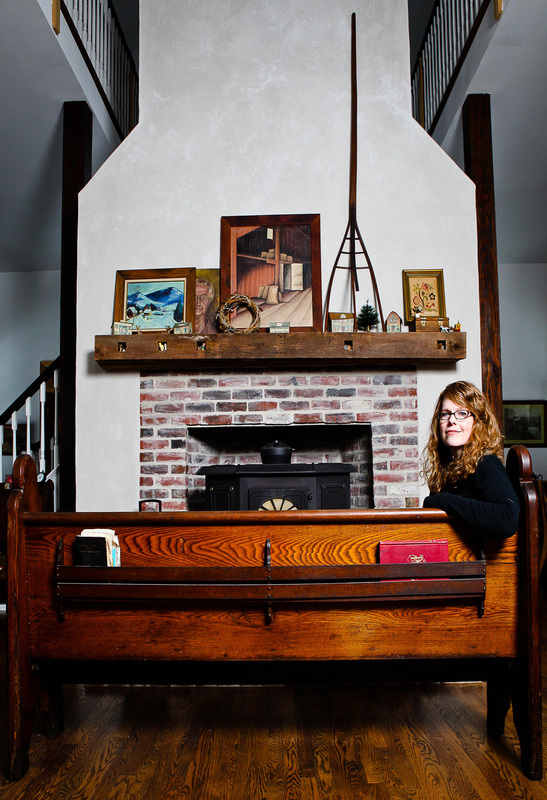 So much so that she and her husband designed their home and studio space like a box church. "No walls except for the bathrooms, open floor plan from floor to ceiling 30 feet up and with a railing all around the top floor as if the choir would be located." Visitors sleep in pews that have been converted into daybeds. She jokingly refers to her church house as her largest art piece yet: true testament to life imitating art. But the journey wasn't easy. "For ten years, my husband and I saved for our house. We both dreamed of owning an old church. Once I completed my Master in Fine Arts from The Art Institute of Chicago, we married and began our search." After failed attempts to finance the purchase of an actual church, they decided to buy some land and build a church of their own in their beloved Bucks County. In 2003, they purchased a little over three acres and started drawing up the plans for their dream church home. "Every weekend, we drove an hour to picnic on our land. 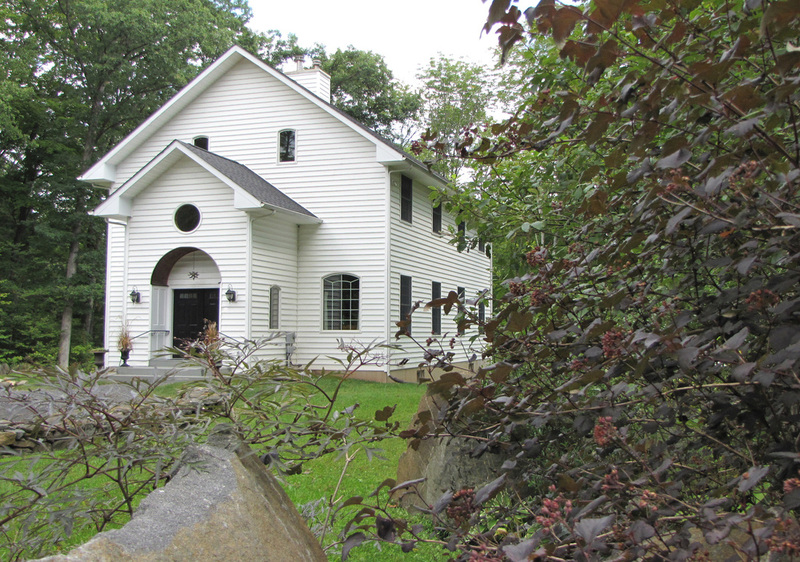 We would just look around at our woods and dream about the day we could afford to build." They would find that in one year's time their dream would not be far off. They were finally able to hire a local contractor to get the building underway and nine months later "The Timber Chouse (church + house)" was born. Reeves's work grows infinitely richer with further investigation. The charming miniatures replacing life-sized heirlooms, the fascination with Victorian hair wreaths and Post Mortem photography, and the idyllic church house backdrop builds up a picturesque context for not only a body of artwork, but of a life's work. A life's work that is rich with ancestral mementos, artistic odes to familial bonds, and the promise of a continued legacy outliving Reeves's own existence. Visit Reeves's website to see more of her work and follow her progress on Instagram (@timberchouse).